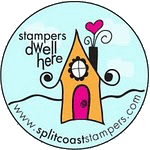 My sweet friend, Anne (aka Itsapassion on SCS) is hostessing the Inspiration Challenge on Splitcoaststampers. The inspiration website Anne provided features Franz Porcelain items...some of the most exquisite and loveliest pieces of porcelain I've ever laid my eyes on. I chose this stunning Floral Bouquet Creamer as my inspiration piece. I was drawn to the vibrant blue. I stamped my Delight in Life flowers with Tuxedo Memento Black ink onto white cardstock and then colored the flowers with Copic markers using brushstrokes. I then lightly added thin black strokes with Marvy LePlume thin point marker. My bow was made with the Bow Easy, and I used the MS zig zag punch for the border under my sentiment. I hope you'll find some time to play in the Inspiration Challenge. 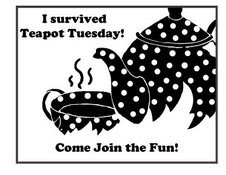 Look for IC204 in the challenge forums at Splitcoaststampers. What a beautiful and classy card. I love those colors too! I do hope you can come down sometime next spring!!! Beautiful colours - that intense blue always reminds me of gentians, which brings back happy memories :D. And I love that beautiful bow, too. These blues are so gorgeous, Charlene!! 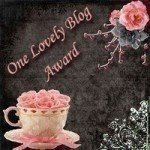 I love all the flowers around the edges, and the wonderful sentiment framed by the zigzag punch! Just lovely. Happy Halloween my friend!! EVERYTHING you make is gorgeous and this is no exception. that blue is just fabulous! Holy guacamole! This is GORGEOUS Charlene!! 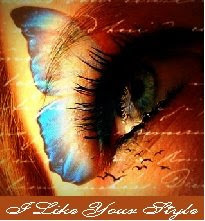 LOVE the beautiful colors and the stamps you used on this!! Just STUNNING! This is drop dead gorgeous! Your coloring is amazing! Charlene -- this blue is brilliant and so stunning -- wonderful card creation!!!! Wowsers Charlene!! This is stunning!! LOVE your flowers!! Amazing!!! My dear you did an AMAZING job with this IC! I love your beautifully blue-colored flowers! They are fantastic! Thanks so much for helping me out this weekend!! SMACK!!! OMG, Charlene, what a gorgoeus design!!!! The blue flowers just pop off the screen....love your design with the sentiment in the center and the beautiful blue bow, too!!!! Wasn't that a fun IC challenge...the DDC girls ROCK!!!! Beautiful! the blue really popps on these flowers, fantastic card!